The doctor will see you now. 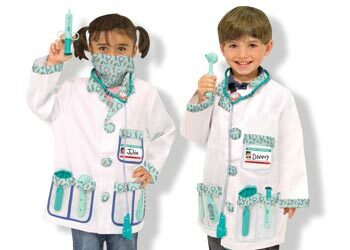 With this set your little doctor will be fully equipped with a jacket and mask, a stethoscope with sound effects, a reflex hammer, an ear scope, a syringe and a name tag for personalising. Suitable for most children between the ages of 3 and 6 years Melissa & Doug is one of the leading designers and manufacturers of educational toys and children's products. Started in 1988 in their garage, Melissa and Doug has something for everyone, with unique and exciting products for children of all ages. Thanks to the Melissa & Doug's hand crafted designs and use of durable wood and other specialist materials, the range continues to have strong appeal to educators, parents and children. Their range of products vary from art and craft, to puzzles, dress up costumes, games and role play resources and accessories.